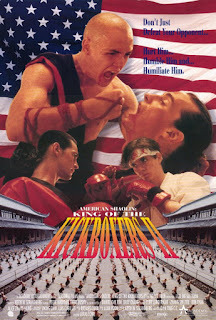 On this week's episode, the gang gets back to their roots by railing on a good, old fashioned, "White Guy Karate" movie: it's American Shaolin: King of the Kickboxers II! Is this the most obnoxious, American pig in all of white guy martial arts? How do we only see the villain for four minutes? And what's with that knock-off NFL merchandise? PLUS: George H. W. Bush and the plot line that made him give up on Melrose Place. American Shaolin: King of the Kickboxers II stars Reese Madigan, Trent Bushey, Daniel Dae Kim, and Kim Chan; directed by Lucas Lowe. I feel like at the first dinner scene, the Moks should havesaid, "oh, you don't like the food? Well if it's not good enough for you, then it must not be good enough for everyone else. So nobody gets to eat tonight, and you call all thank American Shaolin for that." The other guys would straighten him out REAL quick. That's how bootcamp works! I could give 2 shits about white guy "karate" movies, but this episode was one of the funniest you have ever put out. I'd like to say something clever here, but job well done will have to do.